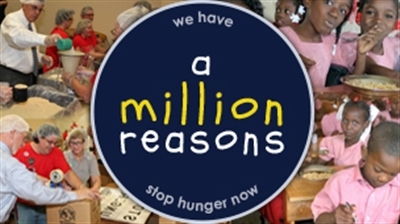 The Florida Conference’s campaign to fight hunger, A Million Reasons, launched its website today at www.amillionreasonsumc.com, and it focuses on resourcing local churches that plan to host Stop Hunger Now meal-packaging events. Resources include marketing and promotion materials for local churches to publicize their events in their communities, encourage their congregations to sponsor a meal-packaging event and invite other churches or civic organizations in their communities to collaborate on an event. An invitation video encouraging local congregations to join the campaign can also be screened for other community groups or churches to encourage them to join a multi-organization event. A press release template is available for promoting the churches’ events to their local secular media, and a list of Florida newspapers and television stations provides contact information. A bulletin insert is available, as well. “While many United Methodists across Florida are packaging Stop Hunger Now meals to help us reach our million meals goal, we realize some churches are challenged to find the financial resources to even schedule a minimum packaging event of 10,000 meals at a cost of $2,500,” Pam Carter, who is the campaign’s champion, observed. Click here for information on the A Million Reasons grant program, or call Clarke Campbell-Evans, conference director of Missional Engagement, at 800-282-8011, ext. 143. The conference is encouraging people to share their personal or church’s experience with meal packaging to fight hunger, and testimonies from all ages are welcomed. A testimonies page gives churches a place to post their videos, photos or written testimonies about their event. Complete information for how to upload or share testimonies is on the website.